An Phuoc is seven years old. She is the youngest in her family and lives with her brother, her sister and her parents near Phan Rang. Her father and mother make a living mainly from small carpentry work and pottery. They are a modest family who have never left their home town. Their ancestors in turn come from a far away county : An Phuoc is a descendant of the Cham minority group, people with Malayo-Polynesian and Hindu origins, who won Viet Nam, but especially Cambodia , where they are established in higher numbers since the second century. There are close to 130,000 of them now living in the south of the country . The Cham ethnic group are Muslims but have strong Buddhist and Hindu influences which are still very present in their rituals. In the desert region of Ninh Thuan reside a few thousand of these men and women. Only some still wear the traditional dress butall speak their own dialect, which is fundamentally different from other Vietnamese languages. An Phuoc has got incredible blue eyes. few foreigners who pass through Ninh Thuan. who has been living for several years now in Vietnam. After landing in Nha Trang, Réhahn went around Phan Rang in the hope of meeting the Cham minority group. 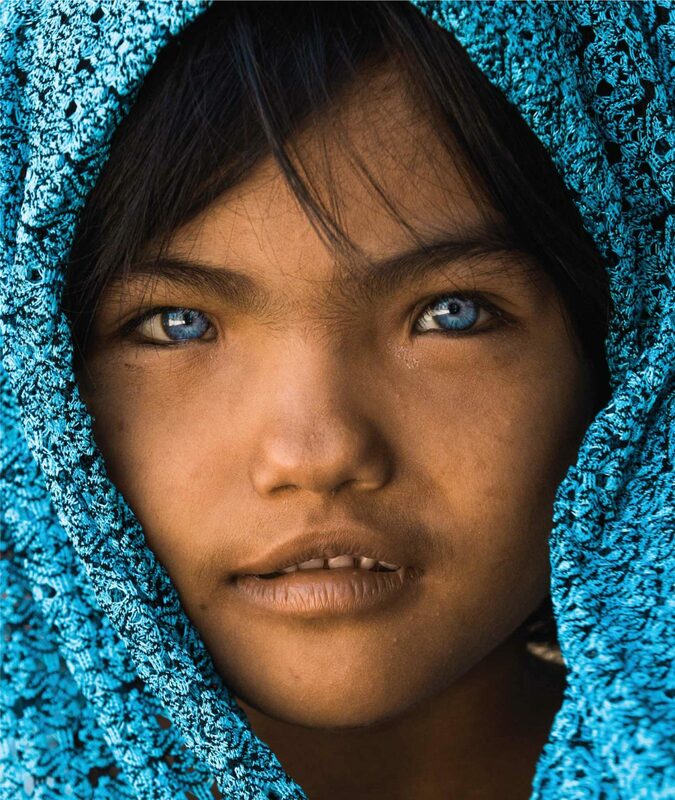 A few weeks ago, one of his 230,000 followers on his Facebook page had contacted him and told him about this small blue-eyed girl living amongst the Cham minority group. The opportunity was there to be seized, and Réhahn decided that he had to see this little girl with his own eyes. It wasn’t hard to find her, since everyone knew her in the area, they’d even given her a nickname ; “the little girl with cat eyes”. The Photographer was taken to the small house of the family who welcomed him warmly. In just a few seconds, Réhahn noticed that An Phuoc was not the only one with those eyes : her father and brother both have blue eyes too. Quickly, they explained to him that the children’s paternal great-grandfather was French, which explained the fact that these Vietnamese had such clear eyes. Pleased with this meeting, the family proudly posed for the photographer who saw in the eyes of An Phuoc the most beautiful of models. erence between his little sisters: An Phuoc and Sapa. The second girl is 14, she also has soft features like her sister but has only one lagoon blue eye, whilst the other is a beautiful hazelnut color. This feature complexes Sapa , since singularities are less easy to live with in Vietnam as they would be in the West . But their big brother was reassured when he understood that Réhahn was not a journalist but a photographer and that his sole purpose of being there was to show the beauty of her sisters to the world. After a few exchanges with the family, Réhahn was invited to share a meal with them , during which a real connection was created between the photographer and his hosts. So finally Réhahn ended up staying with them for two days and became friends with all members of the household. The small An Phuoc even skipped school so as to make the most of his presence . Réhahn knows that his photos will be successfull , so it was only natural for him to want to help this family. He sees his work as an exchange, a partnership : he shall exhibit the photos of the young model, but in exchange he has decided to sponsor the whole family. He also offered them clothes and a bike, enabling Sapa to ride to her school which is located several kilometers away. The friendship between the photographer and the family is deeply real. When it was time to leave , Réhahn promised to invite them to his home in Hoi An. This news was received with great joy and gratitude by this family who have never flown on a plane before and who have always wanted to discover the center of Viet Nam. In June, these newely found friends have met again in Hoi An where they stayed 4 days in the photographer’s house, visiting his gallery Couleurs d’Asie. Thanks to the sponsorship of Réhahn, the two sisters are now learning to speak English in order to be able to communicate better with the photographer in the near future.